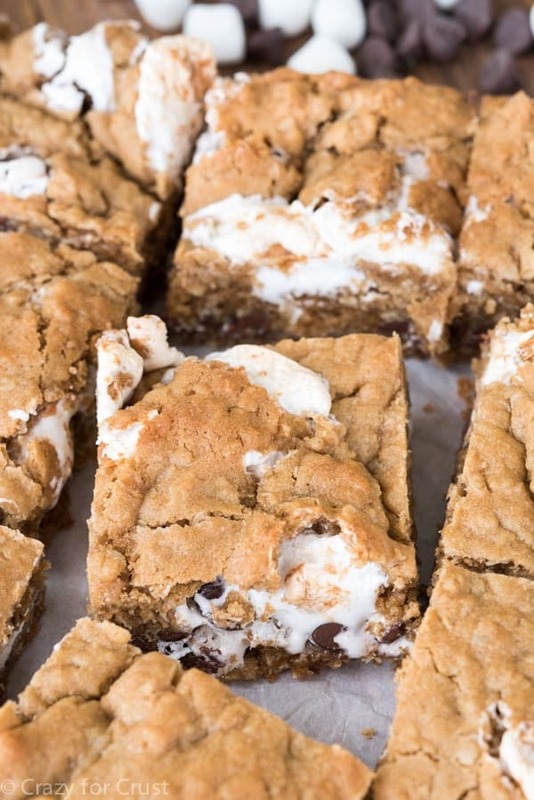 Oh for the love of all things gooey: Oatmeal Cookie S’mores Bars are here! She cannot, for the life of her, close the car door all the way…but she slams the refrigerator door so hard at 6am on Sunday mornings that it wakes me up. She will meticulously pick out a super-cool outfit complete with bright colors and jazzy accessories…but she will go 3 days without brushing her hair. She cannot remember that she is supposed to clear her dishes after breakfast…but she can recite all the passwords for all the iDevices we own. She can’t remember something I’ve told her do to 5 minutes after I’ve told her…but she can recite full conversations I’ve had with friends or on the phone or that she’s heard at the gym daycare. The one thing she can reconcile? That she loves s’mores no matter what vehicle they come in. Parfaits, with cookies, blondies, in pie…she loves s’mores in every form. Who doesn’t? We all know that I’m an indoor s’more person. Hand me a blowtorch and a marshmallow on a skewer and I’ll go to town. Make me sit outside and make s’mores? Not going to happen. So I think I’m making it my goal in life to make alllll things indoor s’more. Frozen pie? Got it. No bake bars? Yup. Blossom Cookies? Check! And now? 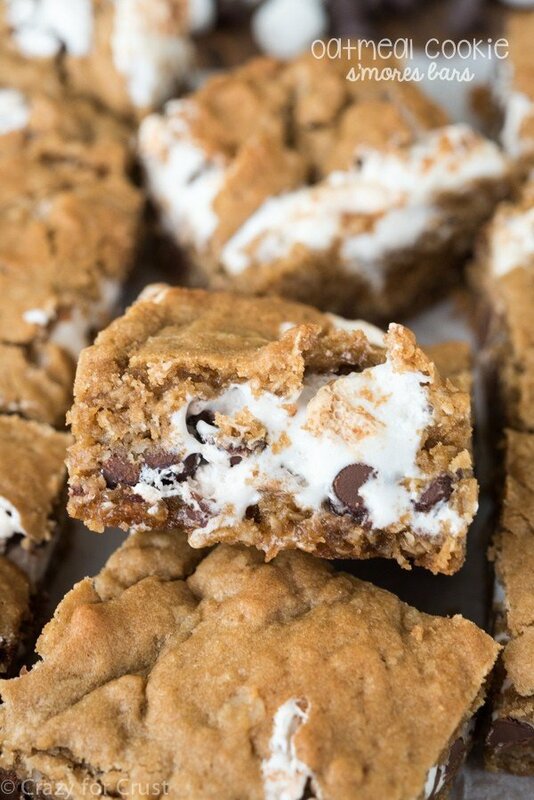 We can add Oatmeal Cookie S’mores Bars to the list. I took oatmeal cookie bars and turned them into gooey s’mores bars. That was a realllly good decision. I was originally going to make these as peanut butter s’mores bars, but my friend Karen has already done that. But when I was drooling at that gooey goodness I knew it had to happen ASAP…so I decided to turn one of my favorite cookies (oatmeal!) into s’mores bars. This recipe is super easy, as usual. I decided to adapt my Dulce de Leche Revel Bar recipe into these s’mores bars. The base of the cookie is pretty much the same as my normal oatmeal cookie recipe except it uses a full cup of brown sugar. Once you whip up the cookie dough, you press half of it into a 9×9″ pan. Be sure to line it with parchment or foil and spray it well with cooking spray: marshmallows get sticky after they’ve baked! On top of the bottom cookie dough layer, you spread marshmallow creme. (Also known as “fluff” depending on the brand you buy.) I heated my marshmallow creme in the microwave for just a few seconds to thin it out a little, which makes it easier to spread over the dough. Then you sprinkle chocolate chips all over it and top it with the rest of the cookie dough. Tip: when you’re spreading the marshmallow, make sure and leave a thin marshmallow-free zone around the edge of the pan. Then, when you drop the rest of the cookie dough on top, make sure it seals around the edges. It’ll keep the marshmallow inside the bars. Unlike regular marshmallows, marshmallow fluff does not disappear when you bake it. It’s like magic! Then you cut the bars and they’re super gooey. And s’morelicious. Is that a word? I think I created a word. These are definitely s’morelicious. And worth every bite! 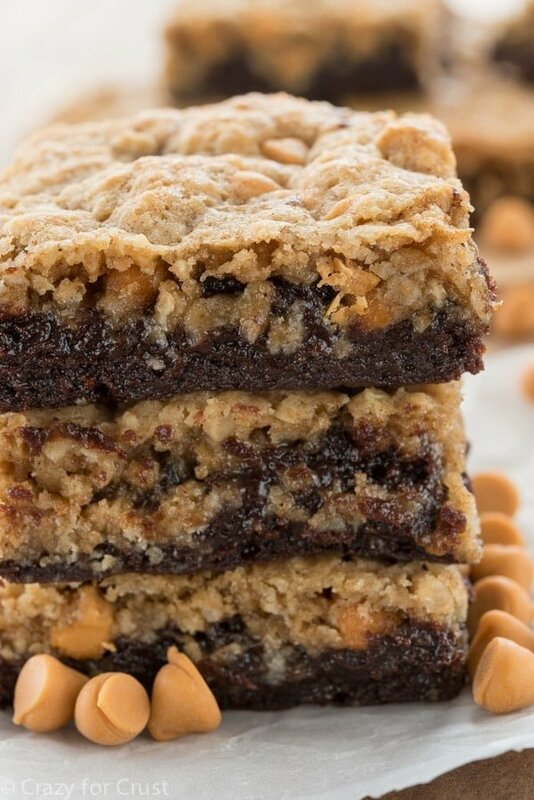 Check out all my gooey bar recipes! 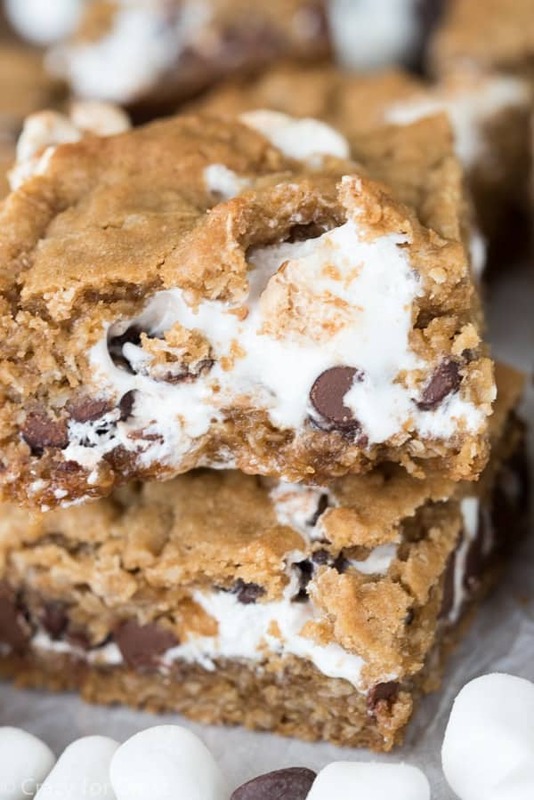 These Oatmeal Cookie S'mores Bars are over the top gooey bars! Oatmeal cookie dough is filled with marshmallow cream and loads of chocolate for the most decadent s'more ever! Preheat oven to 350°F. Line a 9x9” square pan with foil and spray well with cooking spray. You can use parchment in place of foil, if you prefer. Cream butter and sugar in a mixer fitted with the paddle attachment. Cream until smooth, just a minute or so. Beat in egg, vanilla, baking soda, and salt. Mix in flour then slowly mix in oats. Press half the mixture into the bottom of the prepared pan. It will be a thin layer. The dough is sticky so I suggest spraying your hands with cooking spray to help the dough not stick to you. Take the lid and foil wrap off the jar of marshmallow creme. Microwave it for just a few seconds (10-20 seconds) watching it carefully - take it out just as it starts growing up out of the jar. Pour over the bottom layer in the pan and spread evenly, being careful to leave a border around the edge with no marshmallow. Sprinkle with chocolate chips. Use two spoons to scoop the remaining dough. Flatten scoops with your hands and layer over the top of the bars, trying to be sure and cover all the edges with dough. Bake for about 23-28 minutes, until the top of the bars are golden brown. The pan will still be slightly jiggly. Let them cool completely before attempting to slice. They’ll be gooey! Store in an airtight container for up to 4 days. The fact that these are missing an offending ingredient that won’t be named (AHEM*RAISINS) makes me love you and the bars all the more. OMG, another raisin hater. YAY!! I will never willingly put raisins in ANYTHING! 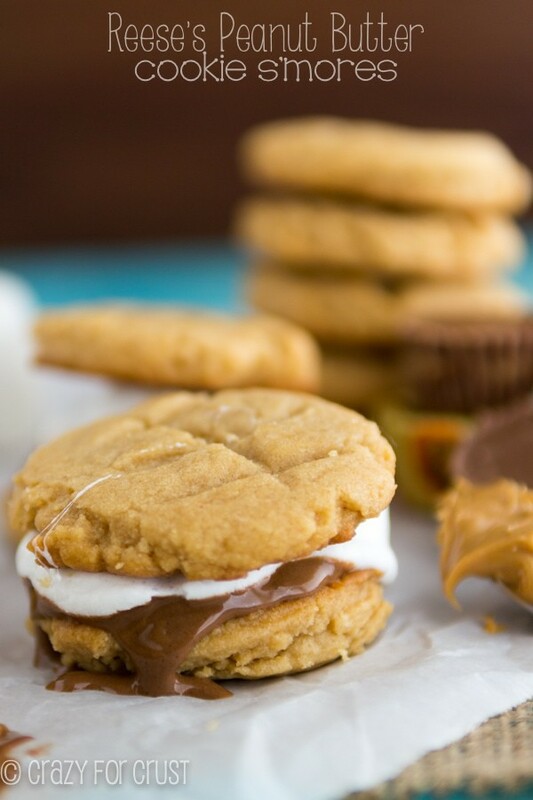 I’m an indoor S’mores person too and these are right up my street, they look fab and so gooey! Sounds like Jordan and I have a lot in common, I have weirdly selective memory, too and a raging s’mores obsession. 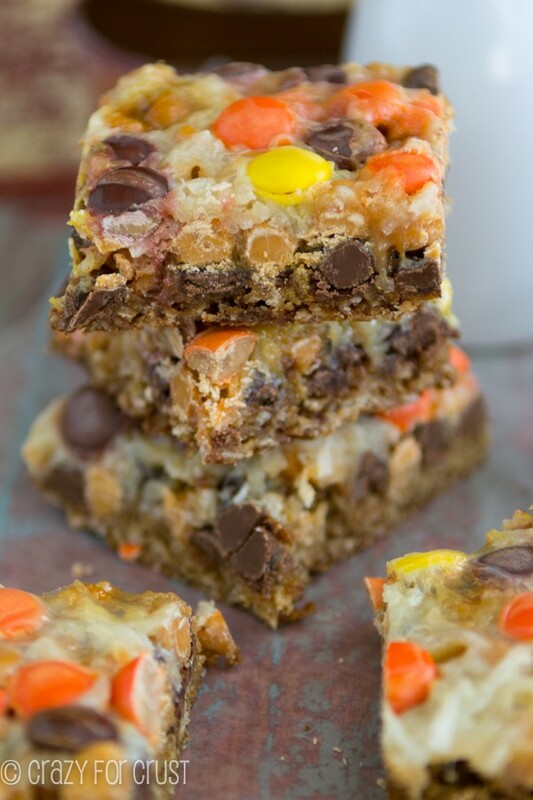 I will totally be making these bars ASAP!! 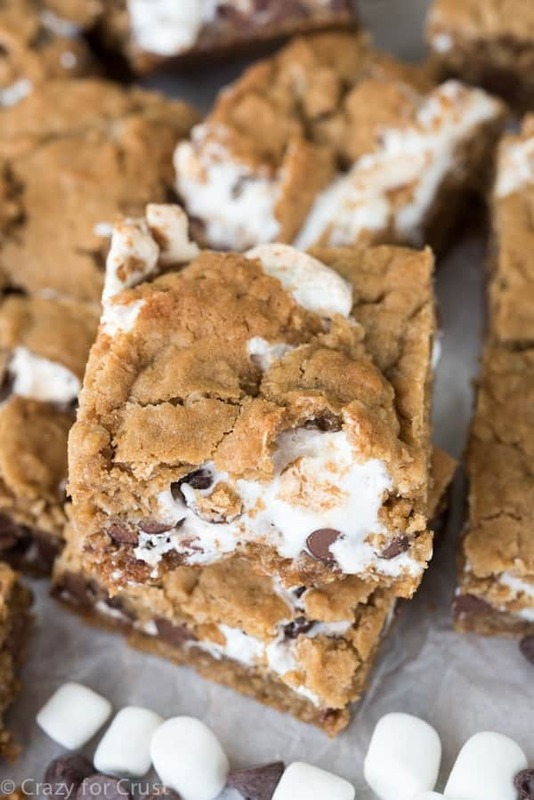 Give me all the s’mores bars! No, seriously. ALL of them! Your daughter sounds like a really fun girl! Any changes to the recipe if I use whole wheat flour instead? I don’t normally bake with whole wheat flour, but when I do I use a mix of all-purpose and whole wheat, otherwise the structure of the result changes. Try doing half and half, or substitute it all with white whole wheat, which I’ve had good success with! For the Oatmeal-Cookie-s’mores bars, could you use regular oats in place of quick cook? Yes, the bars will just be a little heartier. However, you can make them quick cook by giving them a pulse in a food processor or blender, then measuring out the amount in the recipe! Well, the trouble was you made your own fluff. Homemade is very different from packaged. Next time, try using the store bought fluff, and it will most likely work. OK Thanks! My husband said they are intense lol so Ill have to wait a while before trying again. I tried these on a whim and brought them to our Super Bowl party — big success! I love them! Super creative idea for a sweet treat! Thanks for sharing. Wow! I’ve had a strange craving for s’mores lately and have decided, I’m an indoor s’mores person 🙂 I’m going to try these this weekend! I’ve never tried marshmallow fluff before but it looks even more fun than marshmallows. Just wondering, what brand of the fluff did you use? Is there a difference in fluff or creme? I don’t think the brand matters – I used Kraft in these, but I’ve used the other brands over the years. I think any kind works just fine! I would love to try these? Can you freeze these? I’m looking for a different bar recipe that I can freeze ahead of time! Can you substitute some graham flour for the reg flour to make them “s”more taste like smores? 😉 I´m going to try today! I’ve never used that flour, but if you try it let me know how it goes. So I read a few other recipes that said the graham flour would make it too crumbly or mushy – so I just broke them up into small pieces. Worked ok – you get the flavor, but disappointed the marshmallows melt into nothing. Will work on that – maybe a bar will hold up better? !